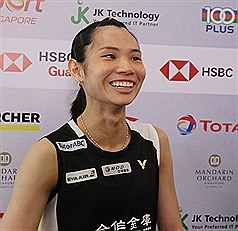 Taiwan's Tai Tzu-ying beat her Chinese rival in two straight games Saturday to advance to the women's singles final of the BLIBLI Indonesia Open 2018 in Jakarta. Currently ranked World No. 1, Tai fought off the challenge from 8th-ranked He Bingjiao 21-13, 21-18 in a match that lasted just 31 minutes. The victory brought her winning streak in major tournaments to 28 matches in a row, a career high. She will next play World No. 5 Chen Yufei of China, who defeated Sung Ji Hyun of South Korea 21-23, 21-18 and 23-21 that day in the semifinals.